I didn't have a specific plan to make these. I didn't see the recipe somewhere and bookmark it or print it out for a future sweet treat occasion. Rather on Thursday night I wanted to make something to take with me to visit friends. I still had some Bits O' Brickle from my second time making the Cinnamon Toffee Blondies. On the back of the package was a recipe for Chewy Toffee Almond Bars. Sadly, I didn't have any plain almonds, only BBQ flavored and that wasn't a taste combination I was willing to try. So I axed the almonds and added some almond extract to the base layer and was good to go. If you have almonds, check out the original recipe and know that it goes in the same places the coconut goes. Heat your oven to 350. Line a 13x9 pan with foil and spray with cooking spray. Beat butter and sugar and almond extract until fluffy. Gradually add flour, beating until well blended. Use your floury hands to press the mixture into the bottom of the pan. Bake 15 minutes until edges are lightly browned. While the base is baking, mix corn syrup and toffee bits in a small saucepan, heating and stirring until the toffee bits are all melted. 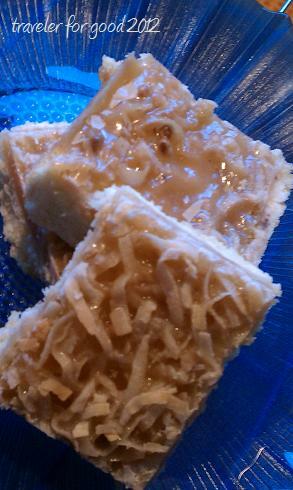 Add 1/2 cup of the coconut to the mixture and then pour the toffee mixture onto the baked crust. Sprinkle remaining coconut on top. Bake an additional 15 minutes or until bubbly. Cool completely in pan, then cut into bars. I let these cool on the counter overnight and in the morning when I pulled them out of the pan to cut them, I had a problem. The toffee layer was pretty hard and it was a challenge to cut them. However, once I had them cut and in a Tupperware container they softened a little bit. By the time we enjoyed them with some red wine in the evening, all was well, just watch out for crumbs. Also delicious with your Saturday morning coffee.